With limitless possibilities for sailing around the world, how do you select which way to go? Choosing the safest and most comfortable route around the world depends largely on the weather. Most cruisers choose warmer climates, sailing down wind, avoiding areas/seasons of storms and hurricanes (called “cyclones” in the southern hemisphere) and using current boosts when possible. By looking at the probabilities of good conditions, it is possible to select a route for the most safe and comfortable sailing experience. Trade Winds: There is a more-or-less continuous flow of air called the trade winds. Because the earth is warmer at the equator and colder at the poles, and because of the earth’s rotation, this flow is generally westerly (from the west) near the poles and easterly nearer the equator (as shown in the Fig. 2). 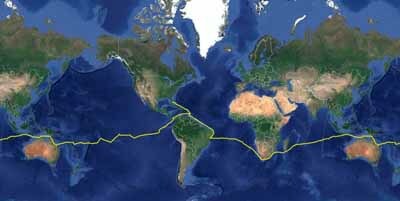 A popular circumnavigation route (starting at the Panama Canal) follows the trade winds across the South Pacific, north of Australia, across the Indian Ocean south of the equator, around South Africa, and back across the South Atlantic as shown by the satellite track of our circumnavigation in Celebrate. Note the large area of westerly wind in the far southern latitudes. You’ll find most round-the-world racers taking advantage of this wind and rounding the world eastbound instead of the more cruiser-friendly westbound. This far southern route is doable but is likely to be rougher, colder, and less pleasant along with being faster. Avoiding Cyclones/Hurricanes: Most cruisers avoid hurricanes by staying out of areas at times when they are most likely to occur. Hurricanes are powered by warm ocean waters and the water is warmest at the end of summer. The worst major hurricanes/cyclones (“storms”) will occur in the northern hemisphere in July-October and in the southern hemisphere in December-April (although dangerous storms can and do sometimes occur outside these periods!). As shown in Fig 3, there are few cyclones at all in the South Atlantic and the Eastern South Pacific. A suggested timing for the route pictured in Fig. 1 is to depart Panama in early February, arriving in French Polynesia as the cyclone season winds down at the end of March. Then, the direct route is to proceed through the Cyclone Zone (stopping along the way) to arrive in South Africa in early November before the start of the next storm season in the Indian Ocean. Then one crosses the South Atlantic in mid January, early enough to get to the Caribbean and leave prior to the start of its Hurricane Season in June. This “one-year” circumnavigation takes about 15 months and may sound like a rigid and speedy schedule but in reality there is considerable time and flexibility for sight-seeing. For example, rather than spending four weeks in French Polynesia, you might choose to stay longer and spend less time in Fiji. In order to have more time in the South Pacific, you might choose to spend a summer (Dec-April) in New Zealand. Note that to stay in sync with the storm seasons, any significant stopover adds a year to the circumnavigation route. By planning to spend the extra year, you don’t have to be in New Zealand until November and you have an extra few months in the South Pacific. Some sailors choose to risk the storm seasons and plan on safe harbors and/or outrunning storms as demonstrated by the large number of boats that spend summers in the Caribbean. This is OK as long as one understands the risks and prepares appropriately but I prefer not to take on this added risk. Major Ocean Currents: The world has areas of major ocean currents such as the Gulf Stream (Caribbean and eastern Atlantic), Agulhas (South Africa), South Atlantic and the North Brazilian that must be considered while cruising the significant bodies of water that must be crossed. In general, the currents flow with the trade winds and are helpful to downwind sailors (except for about 500 miles rounding South Africa). On the occasion of an adverse wind, however, be aware that a wind-against-current situation will cause an unpleasant and potentially dangerous sea-state. This article is intended just to get you started. The possibilities are limitless but by following the weather patterns, winds, and currents, you can plan a cruise which is safer and more comfortable.